PHOTO BY JEREMY MOULE The Rev. 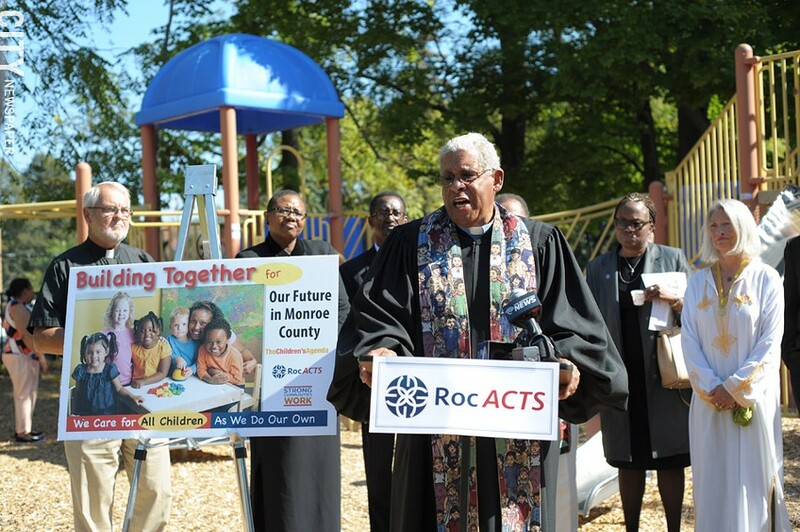 Dr. William Wilkinson of Trinity Emmanuel Presbyterian Church on Shelter Street joined other faith community leaders from across Monroe County last week to call on the next county executive to increase the number of children served by subsidized day care. A progress report released last week by the Rochester-Monroe Anti-Poverty Initiative includes some heavy lifts. For one, the efforts outlined in the report will undoubtedly require significant funding. And the report says that the Rochester region needs to mitigate societal factors, such as structural racism, that keep people in poverty — no simple task. But the group's biggest challenge may be to convince a community jaded by decades of dead-end reports and failed initiatives to believe one more time. "The report in and of itself is another report," says Leonard Brock, the Initiative's director. "It's what we do, how we respond as a community that's going to make this report different." The Rochester-Monroe Anti-Poverty Initiative is led by State Assembly Majority Leader Joe Morelle, Rochester Mayor Lovely Warren, and Monroe County Executive Maggie Brooks, and is convened by the United Way. The effort dovetails with Governor Andrew Cuomo's Rochester Anti-Poverty Task Force, which is made up of members of 20 state agencies working with local public, private, and nonprofit leaders to address poverty in Rochester. The initiative's progress report is the group's first step toward its goal of reducing poverty in the Rochester-Monroe County region by 50 percent over the next 15 years. The report will guide the group's future work as well as investment by government, donors, and other sources. Leading up to the report, 150 local people served on working groups, each tackling a different area as it relates to people in poverty, including health and nutrition; housing; jobs and workforce development; and the justice system. Feedback was also sought from people living in poverty or who have emerged from poverty and are receiving some form of assistance to see what works well and what doesn't. The group is initially focusing on the working poor — about 32,600 people in Monroe County, including the City of Rochester — because these are people who are "leaning in," Brock says, and it shouldn't require as much effort to get them over the hump to self-sufficiency as it would take to help someone who is not working, for example. Focusing on the working poor should also give the initiative some momentum, he says, and it breaks down Rochester's overwhelming poverty problem into more manageable bites. Past efforts tried to do too much at once, Brock says, which helped lead to their collapse. The work groups identified the barriers that keep people in poverty, and it developed 33 recommendations to overcome them. • Public and private policies, regulations, and practices. The recommendations were synthesized to create three initial target areas: systems design, adult mentoring-navigating, and early childhood support. The Initiative will work with IBM to develop a comprehensive, integrated social-support system for the working poor. Rochester's current system is fragmented, Brock says. It responds to individual needs, he says, and does not treat people and families holistically. It's also difficult to navigate, he says. The latter observation is where the adult mentor comes in. The mentor will help the working poor navigate the system and obtain the knowledge and skills they need to land and retain a living-wage job. The creation of an adult mentor is the Number 1 recommendation of the initiative's jobs and workforce development group, says Nicholas Weatherbee, vice president of strategic communications and special projects for the United Way. Early childhood support means making sure the working poor have access to high-quality, affordable, flexible child care. The report also talks about in-home parent training "to give new parents the skills to succeed as their children's first teachers." One of the big questions surrounding the initiative's work is where the money will come from. This is a time of tight municipal budgets and service cuts; Monroe County has been cutting, not expanding, subsidies for child care. That's why it's important, Brock says, to streamline and integrate the services that are available, which should save money and make the system as efficient as possible. Many of the programs and services already exist, he says, but the system is disjointed. Brock says that funding could come from foundations, the state, the United Way, and from private donors. Streamlining services, he says, will help guide investment by the philanthropic community to finally move the needle on poverty in the region. It's important that the community manage its expectations for the initiative, Brock says. It will take a long term, all-hands effort to dig the region out of the hole it dug over the course of decades, he says. "There's no quick fix to poverty," Brock says. During the next phase of work, the Initiative will further refine the preliminary recommendations and offer solutions, with milestones and measurements attached. The group will also enumerate the policy changes needed to accomplish its goals.